Enjoy a retreat at this dreamy spot with a fabulous wraparound deck. Enjoy incredible Lake Superior views from most rooms at Brave Cove. Brave Cove is an unplugged cabin on Lake Superior`s beautiful North Shore. This two bedroom, one bathroom, one story cabin has a wrap around deck and prviate Lake Superior access. Located on the coveted Cascade Beach Road, Brave Cove is a guest favorite You private section of Lake Superior shoreline features this lovely focal point. Upon entering you will find yourself in a cozy, open living area. No TV here Just good times with your friends and family. On a cold summer evening you can fire up the gas fireplace for some warmth and ambiance. Enjoy these incredible views of Lake Superior from the living room. The living room flows into the kitchen area. The kitchen at Brave Cove is small but equipped with what you would need to prepare a meal or two during your stay. The full sized fridge and stove make this kitchen ample size for cooking. The kitchen even includes a dishwasher so there`s no need to waste valuable vacation time doing dishes. The whole living area flows easily together. The main bedroom features a queen bed. Enjoy unpacking with the closet and dresser. The second bedroom has two twin beds and also a closet. The bathroom features a shower/tub combo. Brave Cove is a very popular unplugged cabin on Lake Superior`s North Shore. The deck wraps around two sides so you have plenty of space to enjoy the Lake views. Sit down at the table with your morning coffee and listen to the waves crashing against the shoreline. The beach access is a gradual sloping bath and stone staircase no handrail. The cabin sits just steps away from the cobblestone beach. Enjoy your private section of Lake Superior shoreline at Brave Cove. WIth only one visible neighbor, who is far enough away, you have plenty of privacy. Brave Cove as you will see it when pulling into the driveway at the start of your vacation. Look for the sign off Cascade Beach Road and you`ll know you`ve arrived. The long gravel driveway takes you far away from it all. Daydreaming is definitely allowed! Kick back on the wraparound deck and enjoy the cool lake breezes at Brave Cove, a charming Lake Superior home, located near the town of Lutsen, MN. You can sit back on the deck or take a casual stroll down to the cobblestone and ledge rock beach. Relax with a good book or just sit and enjoy the sound of the waves lapping against the shoreline. This home is a great place to go and "unplug" with no television or Wi-Fi distractions. Just you, the big lake, and the great north woods. Brave Cove is a two bedroom, one bathroom, one level cottage on popular Cascade Beach Road. The site is protected from highway noise and is perched over a lake stone shoreline, leaving you with nothing but the sound of the waves and a peaceful retreat with your friends and family. You may be tempted to never leave during your stay, but should you be on the hunt for a great outdoor adventure you've come to the right place! The Lutsen area offers everything from miles of hiking and biking trails to the Lutsen Mountain Ski Recreation Area. You can also enjoy the Mountain during the summer with the alpine slide and scenic gondola ride up the Moose Mountain Summit. There you can enjoy breathtaking views of Lake Superior. Cascade State Park is just a couple of miles away and features a gorgeous waterfall after a short, easy hike. Take a day trip up to Grand Marais, about 15 miles away, and enjoy the many locally owned, unique shops and restaurants that attract thousands of visitors each year. Whether your reason for visiting the North Shore of Lake Superior is to rest and relax or to find an adventure, Brave Cove is a great home base. I didn't have to personally contact staff, but all email correspondence was helpful, clear and organized. I have rented with CVR before and had only positive experiences. Each has been different, and this one was just as good. The asset Brave Cove has over others is the large corner deck and two big picture windows. I appreciated the hammock and the grill. It is also very private. We have been to Brave Cove two times. It remains one of our favorite places to stay on the No. Shore. The "new" flooring is perfect for the cabin, the views are a constant delight. Best of all, we have brought our pets, who enjoy it as much as we do. The cabin is comfortable and charming. Location was great. Beautiful view. Cabin was clean and well equipped. We loved it!! Our only complaint is in regards to our check-in. We arrived at 4:30pm, thirty minutes after our check-in time (when the prior renters had a 10am check-out time) and the home was still being cleaned. We had to wait nearly half an hour while the cleaning was being finished before we could get into the house. The location is amazing and we enjoyed the cabin! The cabin was in a wonderful spot. Secluded, but not a far drive from restaurants and gift shops. It was also well stocked for visitors wanting to make their own meals. Cell phone service is spotty, forcing you to relax with nature. The walk to the lake front can't be beat and the setup for a firepower is as beautiful as it is functional. The fact that dogs can stay means our whole family can enjoy this lovely escape. Thank you for a wonderful stay! PS The one star subtraction on the check out is only for the mandatory trash removal. Great location! A clean comfortable cabin with a wonderful view! With the cabin located right on the water - it was enjoyable to hear the waves and watch the sunrise from shore. Our stay was quiet and peaceful- a great place to relax after a full day of hiking. We have been vacationing on the North Shore for many years, and this trip was a last hurrah as our youngest leaves for college in a few weeks- so the four of us really enjoyed the family time and having the place to ourselves. In facet, we all got up one night at 4 am to spend time on the deck just to experience the wonderful....a full moon, bright stars and the sound of the waves. The cabin did warm up during the day due to the large windows- but quickly cools down with the fans provided. The great view is certainly worth it! This was a no hassles, relaxing stay- exactly what we needed! The location is absolutely amazing. The large windows give such a panoramic view of the lake. The hammock was absolutely wonderful! We sat out on the little island and just relaxed. It was truly a perfect location. 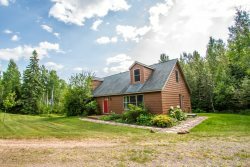 Close to parks, close to Grand Marais, close to Lutsen. Perfect location right on the water. The bed was comfortable and everything was clean. What we liked least, was the water had a definite odor to it as did the towels, and it could use some maintenance overall, like new flooring, and the deck is in need of repair as well. Our friends have a cottage just about 3/4 miles away and they said the water heater just needs to be drained and flushed out to get rid of the odor and some of the brown color. Overall, we would come back. We loved it! Was awesome that it had a dishwasher as so many of the cabins do not, and we like to do our own cooking, so this was a perk! Brave Cove was amazing! Our trip included valleyfair and mall of america, but the cabin stay was the favorite part for everyone, even the 14 and 9 year old! Their electronic devices were down and they enjoyed the beauty surrounding them. It was relaxing and therapeutic for the whole family. Everyone wants to go back and stay longer next time. Thank you for the slice of heaven! Brave Cove cabin was well-stocked, very clean, and beautifully located right on the Superior shoreline. Had the weather not been so rainy, we would have made abundant use of the deck. We wish there had been a bit more of a cover to protect us from the rain, but I suppose that would in turn interfere with sunlight on the sunny days we didn't experience. We appreciated the gas fireplace and the stunning view the most out of our entire experience at the cabin. Everything is perfect at Brave Cove! We were in search of privacy with a beautiful view, and we found both at Brave Cove. The cabins position on Lake Superior was simply wonderful and we were treated to some of the most amazing sun and moon rises! We started every day with breakfast on the wrap around deck and ended it with a cozy bonfire on the beach, then fell asleep to the waves crashing on the rocks. Secluded, yet situated perfectly along the shore for short day trips and excursions. Plenty to see and do around the area, or perfect for just staying put and getting away from it all. The best of both worlds! Home was in wonderful location, with great deck and ledge rock right on the lake. Bathrooms and beds were great, kitchen well stocked. Cooler days when we stayed, and gas fireplace came in handy and was very cozy. Highly recommended. Perfect location. Convenient to everything!! Loved the efficient heating system during this transitional weather.